Big test of Federer's resolve here as he came from a set to defeat Jo-Wilfried Tsonga 2-6, 7-6(6), 6-1 to make the semi finals in Monte Carlo. For a while out there it looked like a French Open 2013 flashback but Roger hung tough, didn't get too frustrated with missed chances and eventually served his way across the line. It wasn't the prettiest match to watch nor did it feature the highest level of tennis. In fact the highlight was probably Fed smacking a ball out the stadium into the Mediterranean sea but the result is all that matters. Let's take a look…. And just before that – live chat was down for most of the first set due to a technical glitch, so apologies if you tried to get on but couldn't. All back working now though. Tsonga set out his stall early in this one; bludgeoning his forehand and trying to paint the lines to keep Fed at bay. His strategy was obvious just play aggressive and try get as many short balls from Federer as possible to put away. Despite his aggressive start it was Roger who had the first break point chances at 2 all where he should really have converted. In Fed 3.0 fashion he then got broken in his next service game after Tsonga hit a vicious inside in forehand winner to lead 4-2. Things got worst as after another wasted break point he was then broken in his next service game as Tsonga took the set 6-2 ensuring he was serving first at the start of the 2nd. The second set is difficult to really describe as it was poor from both guys. Roger had several chances wasting 5 break points at 1 all and then another at 2 all. Whenever the chance came the return either flew long or the ball got dumped into the net, it wasn't great viewing. Understandably frustration was beginning to show on Fed's face and it almost boiled over when he got a code violation for hitting a ball out the stadium at 3 all. Things didn't get much better for the Swiss as he again missed a break point chance at 4 all and then wasted 2 more at 5 all. He was coming up with some great shots to create the chances just failing to put them away, making poor errors or allowing Tsonga to capitalise on short balls. At 5-6 it meant Roger had wasted all 10 of his break point chances in the 2nd set. Despite looking solid on his own serve all set he then slipped to within 2 points of defeat at 0-30 but Trademark 2014 Federer steadied the ship to hold and force the tie break. The breaker was a strange one with Fed racing into a 4-1 lead and then having 3 set points at 6-3. That soon became 6 all but again he didn't back down winning a crucial point at 7-6 to take the set. Looking back at the set it wasn't a set that Tsonga ever came close to winning, he had 1 break at 3 all but other than that it was Roger who created all the chances. I think the biggest achievement from Fed was not to give up or just say ah it's not my day and give Jo Willy the win. He stuck in there and finally got the reward. I thought the third set would be close but for one reason or another Tsonga completely went away, dropping serve immediately and letting Roger race into a 5-0 lead. Like Rosol he managed to avoid the breadstick but Roger closed it out to 30 to move into the semi finals. I was down 6-5, 0/30. It was a tough point at 15-30 as far as I remember with a half volley backhand defense kind of thing. It wasn't looking good there. Clearly was quite frustrating for a long period of time, missing all those break points. Now, looking back, I can take also some positives out of the match. It was just many things went wrong at the wrong time for me: Jo playing well, me playing wrong at certain times, wrong shot selections. It was a tough day at the office. I'm happy I found the way to tough it out. Another match that shows the many different qualities Federer possesses as he dug deep to grind out the victory. It wasn't won by pretty forehands just a nice dose of Swiss determination. Nothing seemed to be going right for him for almost the entire match, Tsonga was hitting the lines and Fed's game was just ever so slightly off. It would have been easy to fold after seeing so many break point chances go by but he didn't. The key to the match was 0-30 then 15-30 at 5-6. Both those points could have ended differently but it was all about confidence levels and even though his game wasn't firing on all cylinders he found a way to hold. Nadal has won a ton of matches in this manner, and whilst you can't draw many comparisons between the two it just shows what can happen if you give yourself a punchers chance by refusing to roll over. He held serve from a tough spot and then won the tie break before streaking to victory. I didn't watch so can't comment too much but looks like a similar sort of match to Roger's. Few problems early before turning the screw to win comfortably in the third. Onto the semi final and always tough to pick a winner between these two. Djokovic has won their last 2 meetings on clay but Roger does lead the H2H 2-0 in Monte Carlo albeit from matches in 2006 and 2008. I think on current form Djokovic is the favourite but it's a real coin toss and I think it will go 3 sets. He's on a high right now after winning Indian Wells and Miami but at the same time his run does have to come to an end at some point. Much depends on how sharp Roger is feeling physically as the match vs. Tsonga today was quite a tough one and Fed did a fair bit of running. I think if Fed has the explosiveness in his legs tomorrow he can get it done but he'll need to back up his first serve really well with the forehand. Movement will be key too ensuring he can turn as many backhands into forehands as possible so he doesn't get pinned into the corner like we saw in Indian Wells. There he got a little flat towards the end and ended up always on the defensive flicking backhand half volleys with minimal power. I'll pick Djokovic in 3, but hopefully he listens to what Becker tells him and Fed can give himself a shot of winning his maiden Monte Carlo title. Finally, big surprise in the other Quarter Final as Ferrer took out Nadal in straight sets. Ferrer hit more forehand winners than Nadal which is unheard of and it's the first time he's beaten Nadal on clay since Stuttgart in 2004. Quite surprising as the Dull slump continues, going to be interesting to see if he can defend the French. What are you predictions for the semi finals? Will we get an all Swiss final come Sunday? And he wins his 950th and me my 7th?? I waited for this one :)) well played guys! Hey Elvis, Don’t get too annoyed! He won! Was always going to be tough. As he said, didn’t know how Tsonga was going to play, and converting breakpoints on clay is much tougher than on other surfaces given the neutralising effect of the surface. Fed 2014 was never going to lose this, even when in a seemingly deep hole. As J said the key game was at 5-6 in th 2nd. Get out of that and only one winner from then on. This tourney has gone better than I Cld hv dared dream of. SF in first clay court tourney of the season.? Worrying about due dates? No Stefan? I”ll take that. Bring on Novak, knowing no Nadal left in the other half! Incentive for an all Swiss final! It’s written in the stars! Go Fed! What a week it’s been! Am liking the new, patient, refuse to lie down Roger! And a very well done to David. 10 yr wait for today! Kudos! Not sure what he could have different Elvis. I thought he actually played quite well for most of it. Both guys levels were very similar and Tsonga did a good job playing aggressive when he needed to. It is his best surface after all. Totally agree! and Ferrer has given everyone hope for rest of clay season! Haha yeah, Becker was watching Fed earlier in the week, wonder if he got any insight. A smashing recap of the Roger-Tsonga match, Jonathan. Agree with all the points. I feel that Roger played an above average match in general except for BPs conversion. Jo played very well and was very agressive throughout. I just don’t understand why Roger did not try something different on BPs, bluffing a little. It was painful to count the number of BPs slipping away. I could just sense that Roger just needed one BP to break Jo’s spirit, which he did in the 3rd set. For tomorrow’s match against Nole, your analysis is spot on but I will fancy Roger’s chances. I feel that in this current form, Roger could beat Nole in three sets. GGL is an excellent clay courter. Still, he was not in the Jo’s calibre. Nole really struggled in the 1st set. Cheers Gang. Yeah GGL played well, once it was 1 set all it was over for him though. One very big takeaway from today’s match is Roger’s determination, not giving up. He will need to do the same. At the IW’s final TB, that was the only thing that was not there. If Roger digs deep no matter what happens tomorrow, he will prevail. Allez Roger! 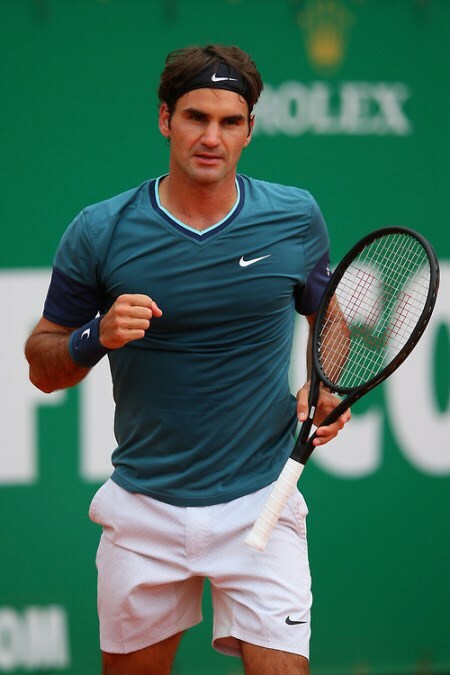 I agree Roger’s determination was key today, and has been a few times recently. Major difference to last year that. He stays calm and doesn’t lose his confidence. But, boy, didn’t he have us worried for a while there today. What a difference 10 minutes or so can make in a tennis match! I went into the kitchen to feed the cat and Roger was losing, came back and he was winning and the momentum had changed completely. Couldn’t believe it. Thought it was all over. Life on a razor edge is what being a Fed fan is sometimes. Novak’s match was very exciting for a while there. I really thought Garcia-Lopez had a chance. But then it turned into the usual thing, with Novak stepping up a bit and his opponent losing his way. Shame. Especially as I had a bet on Garcia-Lopez. Was initially going to bet on Ferrer but decided that would be just silly! But now the semi against Djokovic, I think it’s going to be tight and like you Jonathan I’m thinking Djokovic will make the final. And Ferrer stepping up to the big plate, congrats to him and I think that semi with Stan is going to be a really good match. Can’t wait and Roger prove wrong!!! Stan dominated the vulture Ferrer. Good to see. Yeah he played well, just whack on break points and not quite free flowing. Hung around though and got the win. Jonathan, I have to say you nailed it. Wasn’t a great match but the W/L column reads: Federer def Tsonga 2-6 7-6(6) 6-1, which is what matters. Anyway in my own tennis I pulled off a bit of a comeback myself. I had won 2 matches in a row, but in the third I was 4-0 2-3 down and serving. I managed to hold my serve for 3-3, break and win the set and then won the match on a close match tiebreak 🙂 Unfortunately I just missed out on making the regional final, finishing 3rd overall (I lost my first match). Very simple and to the point: Roger in 3, no matter how. In the final I can see David because of the win and momentum, but if he is too tired, than it is Stan. On the other side of the net Roger, winning his first MC. Then… Roger will win Rome (only if he enters of course). Last year Nastase predicted it and I agreed with him. Think it will come true. I mean as long as HE comes out as the winner…. I still think there’s something about the new racquet at night that Roger is still adjusting to. Probably not the night itself, but could be some different response to changing temperature, for example. SO relieved that he was able to pull it off, and as others have said, impressed that he has the reservoirs of calm & patience right now to do that. Augurs well for the rest of the season, whatever happens tomorrow. It’s really going to depend, I think, on which version of both guys shows up – it’s been pretty variable so far this season for both of them. And personally, I like the less-combed look, though I agree Rafa sometimes leaves the hair looking like a rat’s nest! 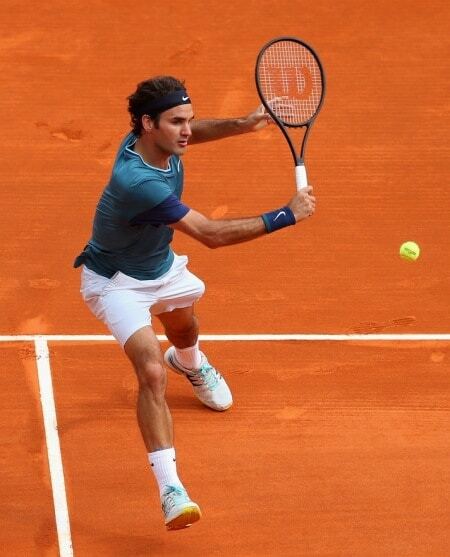 I think the racquet is playing like an extension of his arm. Temperature and conditions would only really effect string tension not the racquet itself. Seems very comfortable with it. Never looking at is as though it’s let him down. Yeah, would be great if Roger can knock off Djoko tommorow, because he would then have a chance to get two of the four major achievements he has yet to get in his career: the Davis Cup and a title in Monte Carlo. Well he would have the chance to win the Davis Cup anyway but would be great if he would have only two holes in his resume! That would mean out of 9 masters, the YEC, the Olympics (singles gold), the Davis Cup and the slams (thats 16 major events in total!) he would have 14 of them. Stan waiting in the final, would be an interesting match. What a match! I guess all of us were on tenterhooks the whole time! That long rally at 15-30 5-6 down in the 2nd set was the big crucial point and Roger won it – gave him more breathing space and the basically the whole match to fight back and win. Allez! Yeah GOAT play at 5-6. Do you think Roger will win MC if he beats Novak tomorrow? I guess it all depends on how physical today’s match as to whether he can win on Sunday. Roger in straights, if he is to win this one. 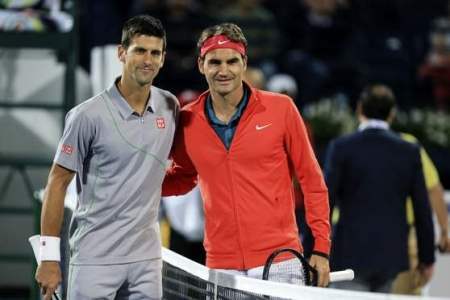 After the tiring match today, a 3 set match would favor Djoker for sure. Hope Fed does not try to beat Djoker in a baseline battle. He needs to come in on great approaches and also force the Serb to volley more where he still looks lost. Long time no see everyone. Very very surprising to see Federer in Monte Carlo but I would have to agree with your suspicion Jonathan, that baby Fed is due soon and Roger needs to breakeven with ranking points I guess. Also seeing some press about him missing the FO? Media will do anything to get reads but I do believe if the baby and Roland Garros came at the same time, Roger would have no problem missing a slam and I’d support that decision wholeheartedly. Haven’t seen Novak play this week but am expecting him to still be confident, now especially since Rafa is out, got a golden opportunity to get his campaign on a roll to knock Rafa off at RG. Nice one on hoping Djoker will listen to what Becker tells him haha but it’s a huge opportunity for Roger to get Monte Carlo under his belt. Either way looking forward to another chapter in this rivalry. Allez! Djoker supposedly carrying in injury but not sure. Taped wrist. I doubt it will be a factor. Well Stan just dispatched Ferrer, 50% Swiss Final currently, hopefully Fed can hold his end of the bargain up. Yeah any time the rallies get extended and Fed hitting 2 / 3 backhands in a row it’s going to be tough to get out of. Haha I don’t bother reading his pressers, same stuff every match. Mother******! So, it’s the back again. Jesus Christ! Has anyone on this planet, ever beaten a 100% Nadal? Djokovic might just withdraw before the semifinals 😉 . Whatever happens, I give the edge to Fed the WC to win the Mc title! Now, who saw that coming? Is that wishful thinking or a real possibility? But this year, not gonna happen. Hey guys, I have a feeling it will be Ferrer in the final instead of Stan the Man…. Folks, don’t be fooled. Nole has been learning Nadull’s trick – setting up a smoke screen and giving him something to fall back on, in case he loses. Come on Roger, let’s make sure to give Nole a chance for him to use his excuse! Allez Roger! Hey Gang, I like Novak. Not always…… but most of the times (unless he beats Roger), but to be honest I really hope nothing is wrong with his wrist. He is a good and funny guy, just sometimes…..
And I learned my lesson… when I saw Delpo play, I always commented a bit negative about him acting like an old man in between points (which is true…), but now that I know that he is out for the rest of the season…. I miss him…. The expression put up or shut up comes to mind. Hi Katyani, I like Nole as well 🙂 . I think that he along with Roger are the one to beat on HCs. The additional fondness comes from the fact that Nole has figured out how to beat Nadull, 🙂 while our Maestro still struggles 🙁 . I feel that all these guys (including Nadull, Andy, Stan, David, JMD, Birdman and Jo-Willy make the ATP tour so great 🙂 . However, whenever it comes down between our Maestro and anyone, I never waver 🙂 . Good grind from fed. Also good that Jo willy is finding some form, he is a fun player to watch on tour when he is firing. In other news, I watched the djoker match, more because I didn’t want to get up from the sofa than anything else but gg-Lopez was awesome! Ok granted djoke was off but he plays a great brand of tennis and his movement on clay is fantastic. Hope he can keep it up and to see more of him during the clay stretch. GGL has a decent game, he has some good scalps in his career, beat Murray I think in Miami or IW one time. If Fed will play at the RG just one thing i want.Avoid Tsonga before the semifinal. IMO, Roger will always beat Jo-Willy. The last year’s QF match was a completely one-off when Roger had very bad back. Jo-Willy is more dangerous on grass where his agressive hitting with a good movement is more effective. I think Tsonga is more effective than on grass. Wow! This performance from Stan is making Nadal’s defeat look even more embarrassing. Nadal avoided Stan because he hasn’t found a “solution” yet to beat him. Once he feels confident, he will face him, to make it a better H2H. It is lookng good for all Swiss final, Utch, Simon, 🙂 🙂 . Very well done for Stan the Man 🙂 . Fasten the seatbelt, here we go. Allez Roger! Great first set from stan, second was very shaky. What a time to serve an ace! One done, one to go 🙂 . Allez Roger! A set and a break up! 🙂 🙂 Let’s go Roger, let’s go! Allez! Tomorrow will be a Swiss day at the MC in the history of the tournament, very special! Good result, too bad Novak was injured though. All swiss final!! 😀 Will be a great match tomorrow! My sister was saying I wasn’t sympathetic to Djokovic on his bad wrist. I told her I will be once Federer wins 😉 . So, now I ask, pls what was wrong with Djokovic’s wrist? I don’t think it is too serious though. Now Nole’s wrist, I trust that it is just a bit of discomfort. At the highest level, any discomfort could be a distraction, which could affect their level. I trust that the outcome is never in doubt. Hey Gang, would it not be great, Roger deciding last moment to take the wildcard and ending up winning MC??? Still, hope Novak’s wrist will be fine…. Katyani, did you spot the pattern? good work 🙂 . Me too, hoping that Nole’s wrist will be fine. I missed the last half of the match and had to abandon live chat due to an unexpected visitor. Terrible timing! From what I’m reading it was pretty one-sided in the end though so I maybe didn’t miss too much. Not the momentum of an exciting match at least. Yes, hope Nole’s wrist is okay. He did look in great discomfort. Is he playing Madrid? Fingers crossed he doesn’t have a similar problem to Delpo and now Laura apparently – though maybe he shouldn’t cross his fingers at the moment. First set was awesome. Try to catch it! Especially Fed serving at 4-5, 15-40. Played two huge points to save the set. And then at 5-5, from 0-40 down, breaks Novak and that was it! Game over. Played great. Very consistent. Yes, I saw the first set. Great stuff wasn’t it. I was a bit upset at not having the company of live chat. Would have loved to experience it together.